“I said; open up, in the name of the King!” the knight repeated from outside the house of Morguss. He banged his spear against the fragile door again, which began to buckle. “I heard what you said,” Morguss grumbled from within. The door flew inwards, and revealed the three witches inside. “Ah, I was only expecting one,” the knight admitted, taking in the impressive sight of the three black clad women. “Your lucky day, then, isn’t it?” Edna cackled from behind Morguss. “By what right do you tread on Lord Darigan’s land?” Morguss asked importantly. “By this right,” the knight told her. He handed over a document containing Darigan’s signature. It was an order for the extradition of Morguss to Meridell. “How dare he? After all these years of loyal service! If this is still about helping Kass, I’ll kill him!” Morguss cursed. “You will come with me,” the knight ordered. The three witches stared at him. Or rather, two of the witches stared at him. Morguss seemed to be staring past him, at the crowd of citadel inhabitants that were observing the scene. “I’ve had just about enough of this! We are witches, witches! You know the ones that curse your children and cackle in the dead of night? You don’t go around arresting witches! You run away!” Morguss explained. “Ah, now that was back in the old days,” the knight said politely. “The old days?” asked Sophie. “Times have changed, you see. The King’s advisor, Lord Belton is streamlining life in Meridell. We have no need for witchcraft anymore; we have a better magic,” the knight told her knowingly. “A better magic than witchcraft?” asked Edna, slightly offended. “Bet he means Faerie magic,” Morguss said calmly. “No, Lord Belton calls it ‘teck-knowledge-ee’,” the knight said with some difficulty. “Does that involve a lot of potions?” Sophie asked. “Nope, it’s got things called ‘kemy-cals’, which look like potions though. The main part of it is that there are no spells, only ‘ex-perry-ments’ based on ‘sy-ants’,” the knight told them knowledgeably. “It’s not based on the lore?” Morguss asked in horror. “No, it uses ‘sy-ants’,” the knight confirmed. The witches mulled this over for a few moments, and Edna and Morguss exchanged nervous glances. Eventually, Morguss turned back to the knight. “Well, we’re not having any of it. Go back to your master and tell him that Witches do not bend to silly cults!” she said smartly. “Or what?” the knight asked. “Or we’ll turn you into a Mortog!” Edna cackled. Mortog transformations were her specialty. “Well, the thing about that is, Lord Belton says now that we have ‘tek-knowledge-ee’ we don’t need to fear magic no more,” the knight replied, almost apologising. “Don’t need to fear it!? I’ll show you!” Edna screamed. She shot out a green and warty hand towards the knight, and began to cast a spell. Something was wrong; instead of the blast of raw magic, a few sparks left her finger and bounced pathetically on the floor before fading. Edna stood there opening and closing her mouth for a few moments. The crowd gathered behind the knight erupted into hushed gossip. “It’s going to take us weeks to put this right,” Morguss grumbled. She kicked the knight firmly in the shin, causing him to collapse on the floor. Then, she turned on her heel and disappeared within the house, returning a moment later with three shabby looking broomsticks. “I don’t like using them myself, but we must get to Meridell Castle quickly to sort this stuff out. Needs must, as they say...” she explained, handing two of the broomsticks to Edna and Sophie. “I don’t understand, what are we doing?” Sophie asked. “We’re going to see this Lord Belton, and we are going to give him a piece of our minds. This is witch country; you can’t have people running around not being afraid of witches in witch country, can you? We have to put a stop to this before it goes any further,” Morguss told her. She mounted the broomstick and kicked off with her feet. It climbed steadily in the air. The knight seemed to be regaining himself, so Edna and Sophie quickly followed suit. The witches were going abroad. The sun was setting when they set their broomsticks down in the courtyard of Meridell castle. Knights rushed over to contain them, but the three witches swept by with an air of superiority that could have fooled people into thinking they were royalty, had the witches not been wearing black cloaks. Edna stopped smartly in front of the castle’s main doors and addressed the guard. “Three Witches, here to see the King,” she said importantly. “He’s been expecting you. Come this way,” the guard replied. He banged once on the great oak doors, and they slowly creaked open. As they were escorted inside, the witches couldn’t help but notice that a thick plume or smoke seemed to be coming from behind the castle. They were taken straight to the throne room, a long and lavish chamber with enough marble and tapestries to finance a small country. The immense figure of Skarl sat slouched in his throne. Next to him, among the throng of guards, a tall and weedy Kyrii who was grinning broadly stood. “Three witches, your majesty!” the guard said as he saluted. Skarl waved him off dismissively and the guard hurried out of the chamber. “So you are the three witches that assaulted a good citizen of Meridell?” the thin Kyrii asked accusingly. “If he’d have kept his nose out of our business...” Sophie grumbled. “Who are you then?” Edna asked impatiently. “I am the King’s advisor, Lord Belton,” the Kyrii said importantly. 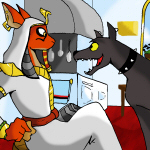 Skarl seemed to be daydreaming, hardly paying attention to the happenings inside the chamber. “Oh, so you’re the one causing all this trouble?” Edna asked. “Trouble, what trouble? I am revolutionising life in Meridell, for the benefit of all its residents,” he sneered. “Magic is for the good of its residents!” Sophie shouted. “That’s what the castle practitioners said before we imprisoned them,” Belton told them. “Castle...? You don’t mean little Lisha? You’ve locked her up?” Morguss asked, outraged. Skarl appeared to flinch at the mention of Lisha’s name. “Of course, she practices a forbidden art,” Belton said simply. “I’ve had just about enough of this!” Morguss bellowed. She threw her arms wide, summoning up the most lethal spell she could think of. On a good day, it would have melted Belton where he stood, and a good portion of the castle behind him. Instead, there was a faint fizzling sound and an indistinct pop. Belton remained where he stood. A broad smile spread across his face. “You will find your magic quite useless. You see, I know your secret,” he said acidly. Edna and Morguss looked at each other. “What’s the matter?” Sophie asked them. “Allow me,” Belton said in an unconvincingly sympathetic voice. Morguss shot him a glare that could have killed. “What are you going to do?” Morguss asked fearfully. “The people of Meridell are leaving magic behind. Once, when they had an illness, they would go to you for a potion. Now, they will go to a certified doctor for the cure. Once, they would peddle in market stalls all day long to make their way. Now, they will work in a building that contains all the products they will need. They will work for companies, not themselves. We shall be businessmen, not farmers. Meridell shall be the new Neopia Central... no, we shall be better than Neopia Central. We shall be the new centre of commerce for Neopia, the new hub of progress,” Belton explained lavishly. “The new hub of power is what you mean to say. With you at its centre, I should imagine,” Edna said bitterly. “I am but a humble servant of our benevolent monarch,” Belton said with a faint smile as he bowed towards Skarl. “Just what have you done to him?” Morguss asked. It was clear that Skarl wasn’t himself; the King had said nothing. “I’m sure I have no idea what you are talking about. Now, if you would kindly allow the guards to take you to the dungeons, I have a country to revolutionise,” Belton said dismissively. He clicked his fingers, and three soldiers rushed forwards, surrounding the witches. “Stop or I’ll... oh what’s the use?” Edna muttered. The three witches sagged under the pressure of numbers, and allowed themselves to be captured. As the witches departed, Belton turned to behold the incapacitated Skarl. The corners of the King’s mouth were beginning to twitch. “I shall have to double your dose,” Belton remarked to himself. He left the King alone in his audience chamber, and thought to himself just how easy it had been to take complete control of Meridell. "Listen up, all of you," he said. "Stay behind and watch, got it? No heroic deeds. Heroic deeds tend to be stupid most of the time and I don't want anything stupid there, savvy?"